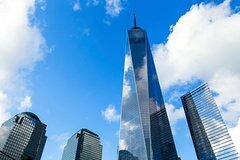 This 6-hour fully guided sightseeing tour includes a 1 hour sightseeing cruise of the NY Harbor and pre-reserved tickets to the One World Trade Center Observation deck. You will be picked up by a state-of-the-art luxury vehicle in a convenient midtown location. Visit iconic sites, buildings, and parks with a professional tour guide, join your guide on a guided cruise of the NY Harbor for views of the Statue of Liberty, the iconic Manhattan Skyline and more, then finish your experience by skipping the lines to go to the top of the tallest building in the western hemisphere. In less than 60 seconds. Experience 3 floors filled with innovation for a walk high above the streets of New York. This fully guided tour is the ultimate way to get to know New York City in style. You will be picked up by a state-of-the-art vehicle in a convenient midtown location. Visit iconic sites, buildings, and parks with a professional tour guide. This fully guided tour is the ultimate way to get to know New York City. Travel in style on a luxurious vehicle in absolute comfort. During your experience join our guide on a 1-hour long guided sightseeing cruise of the New York Harbor and take in the city’s most amazing views: The Brooklyn Bridge, Statue of Liberty, and the famous Manhattan skyline. To truly enjoy a 360 view of NYC end your experience for stunning panoramic skyline views of NYC from the top of One World Trade Center. Go up to the top of the tallest building in the western hemisphere in less than 60 seconds. Experience 3 floors filed with innovation for a walk high above the streets of New York. During the tour, you will get fantastic 360 views of: New York City including: The Statue of Liberty, the Empire State Building, the Brooklyn Bridge, various shopping boutiques on Fifth Avenue, Tiffany’s, Trump Tower, Time Warner Center, St. Patrick Cathedral, and more.